The price is right when it comes to this multicolor LED smart bulb from LOHAS. 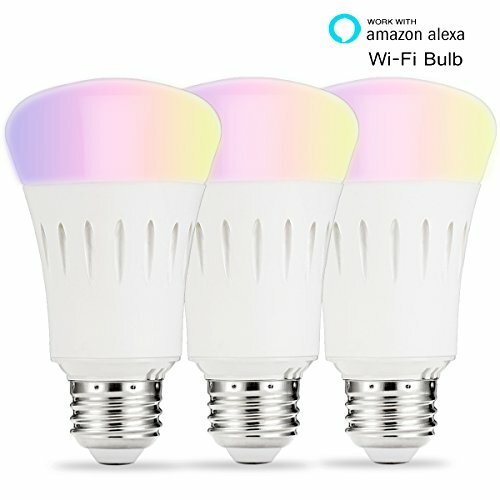 Despite some brightness issues and rather simple app, this can be a cheap, fun way to brighten up a room with a bulb that connects directly to your home's Wi-Fi. Our search for a budget multicolor LED bulb continues with a little known company called LOHAS that has generated a bit of buzz on Amazon. The company which specializes in LED bulbs of all kinds seems to have recently taken a crack at the smartening up their bulbs. At the time of this review, the LOHAS Smart LED Bulb (@ Amazon) comes in at just under $20, making it one of the most affordable multicolor lights on the market that doesn’t require a hub. It promises compatibility with both Amazon Alexa and Google Home, while providing a smartphone app that can be used to operate the bulb when at home or away. Despite it’s A19 designation, the LOHAS Smart LED Bulb isn’t quite shaped like the old incandescents you’re used to. Instead of a globe at the top, it pops up more like a muffin top. The bottom half works as a plastic heat sink and it’s a tad heavier than the newer LED bulbs on the market. Design wise, it looks and feels like an older generation of LED bulbs when they didn’t quite match up looks-wise to their incandescent counterparts. There is technically nothing wrong with this although you may have issues with lamp shades that have clip-on adapters built for more rounded bulbs. Setup was surprisingly easy for a company we had heard little about. LOHAS includes a detailed instruction sheet that walks you through the steps. The first step involves downloading the Tuya Smart app. For those unfamiliar, Tuya is a company that not only has their own line of products, but also provides their software to 3rd party companies like LOHAS that don’t have their own development team. For instance, the Geeni line of smart home products uses a white label version of this very app. The app is currently available for both iOS and Android and requires the creation of an account using your e-mail address or phone number. Connecting the device to the app was simple. With the LOHAS Smart LED Bulb screwed in, we turned it on along with the app on our smartphone. The light blinks as you connect it through the app. You’ll then connect it directly to your wireless network by entering the password. Note that the bulb only supports 2.4GHz wireless networks which is a slight disappointment. With the setup of an account and the connection of the bulb to your wireless network, you’re looking at 10-15 minutes tops. The app is fairly basic and can feel a bit like it’s not built specifically for this the LOHAS bulb. Turning on and off the device is simple and provides minimal lag. The same for adjusting the brightness and color. Color is controlled through a color wheel on the app which allows for endless varieties, but also can make it a bit difficult to pinpoint a specific color. Options for a schedule and timer are available although didn’t perform at a consistent enough of a level that we’d trust it on a regular basis. A “scenes” section provides some pre-set color schemes that range from a color they think might be comfortable to read in (a weird orange) to rotating through the entire spectrum. They’re fine for demoing what the bulb can do and might be fun at a college party or something, but otherwise we don’t think you’ll use them. With budget bulbs you have to expect a drop in light quality and the LOHAS Smart LED Bulb is no exception. While listed as a 60-watt equivalent that produces 810 lumens, it’s definitely not as bright when placed side-by-side with a Phillips of identical specs. Despite the brightness issue, the colors do hold their own against name brand competitors. While the dimming function works fine within the app, the bulb doesn’t work well with an actual dimming switch. Overall it’s better than your typical off-brand LED bulb but still not the same quality you’d find from a name brand. Perhaps one of the biggest selling points is the voice control ability through Amazon Alexa or Google Home (Assistant). Connecting it to the Echo was fairly easy after enabling the Tuya Smart skill. It found the bulb without a problem and I was able to change the name over to something a bit easier to remember. I was able to turn the light on or off, dim and brighten (using percentages), even change the color using my voice. Syncing with Google was a bit finicky. While it eventually did connect and work, it wasn’t always able to find the bulb when I needed it and became more frustrating than convenient after a while. Currently there is no Apple HomeKit support. While I liked most of what I saw from the LOHAS Smart LED Bulb, I’m not sure I’d put it above the Geeni Prisma. While both use a near identical app and have the occasional connection issue, the Geeni is brighter at the same price. It’s also a bit lighter and features a more modern design. But with both I’m still skeptical about their long term usage. While the LED bulbs should hold up fine, the device relies on a 3rd party app to stay-up-to-date along with trusting that a rather unknown light bulb company stays in business and supports the product for years to come. For instance, it doesn’t appear that these bulbs are getting firmware updates at all (unless they’re happening behind the scenes which would concern us as well) while major brands do on a regular basis. Despite long-term concerns, I still think the LOHAS Smart LED Bulb is fine for someone who isn’t ready to drop a bunch of money on a system like the Philips Hue. 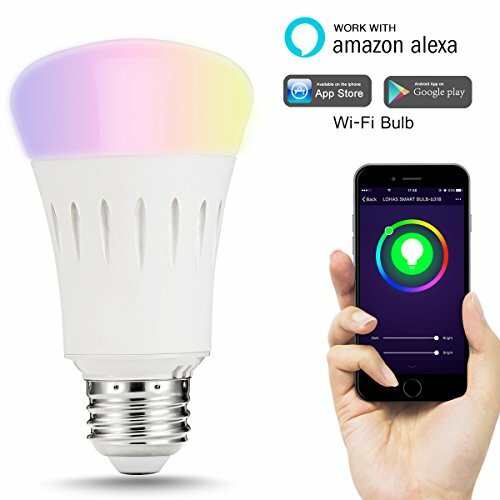 There is an advantage to being able to buy a bulb and connect it directly to your home’s Wi-Fi in minutes. This can be an easy addition to some holiday decorations or to make a kids room light up in a fun way. But if you’re looking to transform your home over to something that you’ll be using a decade from now, I’d be wary and would recommend holding out for a brand name that you know will be supported down the road.